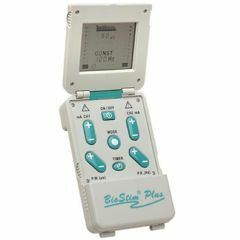 The BioStim Plus compact size and user friendly programming features make the BioStim’s design unique among Electro-Therapy Devices. This two channel device incorporates touch proof design, digital keypad, large LED display screen, four preset protocols, and is run on two AA batteries. Includes electrodes, carrying case, lead wires, batteries and instructions. Average Health. Sit at computer all day. shoulder stiffness. shoulder stiffness. The batteries have a long life. It's so small I clips on a waistband so hands are free to do other things around the house. Helps me work out kinks if I didn't have a restful night's sleep. Only thing that helps relieve my Mother's back pain from osteoarthritis. lower back pain. pain from herniated disks. pain in shoulders. arthritis. Average Health. Sit at computer all day. Sit at computer all day. This was recommended to me by my daughter Her dr. recommended a tens unit for her to use at home and she found this one online with very good reviews. I got the same one and am very pleased with it. Easy to use and only uses 2 aa batteries which last a long time. I sit at a computer all day and my shoulders are sometimes painful, this is much better and healthier than popping pain pills. I purchased the BioStim M7 a few years ago and cannot find any instructions on placement of pads for use of Carpal Tunnel Syndrome. Is there an instruction booklet of pad placement. Also, is the BioStim M7 the same as the BioStim Plus? Do These Units help With Diabetic Neuropathy Pain in the Feet? ?